Serve up deliciousness at dinnertime with our tomato-basil chicken recipe! 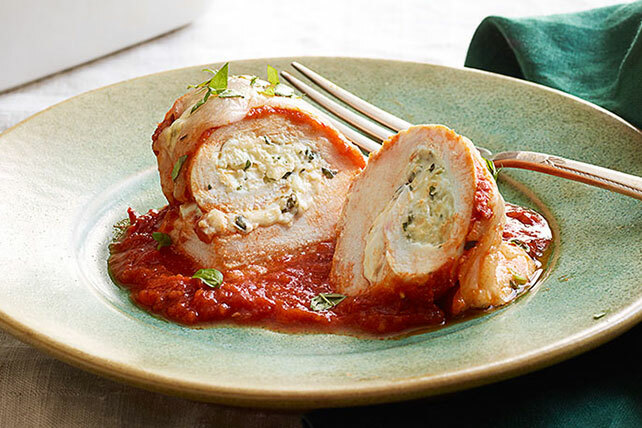 Topped with pasta sauce, Tomato-Basil Chicken Roll-Ups are a family favorite. Mix cream cheese, onions, 2 Tbsp. basil and 1/2 cup shredded cheese until blended; shape into 8 logs. Place 1 log on one short end of each chicken breast; press lightly into chicken. Roll up tightly, tucking in both ends of breast around filling to completely enclose filling. Place, seam-sides down, in 13x9-inch baking dish sprayed with cooking spray; top with pasta sauce. Bake 30 min. or until chicken is done (165°F). Top with remaining shredded cheese; bake 3 to 5 min. or until melted. Sprinkle with remaining basil. Serve with hot cooked pasta and a mixed green salad tossed with your favorite KRAFT Dressing. Place 2 chicken breasts in large freezer-weight resealable plastic bag. Pound chicken with side of heavy can, rolling pin or meat mallet until 1/4-inch thick. Remove chicken from bag; set aside. Repeat with remaining chicken breasts. Recipe can be assembled ahead of time. Refrigerate up to 2 hours before baking as directed, increasing the initial bake time if necessary until chicken is done.